Thea can’t blame her religious upbringing for this hideously ruffled blouse she wore for her senior picture. Or CAN she?! 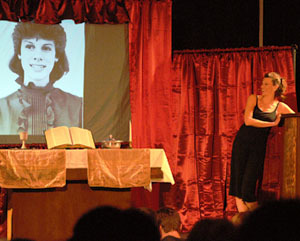 Usually after a show, several audience members come up to Thea, wanting to tell her about their own experiences with religion. She LOVES to hear these stories — they motivate her to keep going! If you have a story you’d like to share with Thea, please take a moment to fill out the form below. She promises to protect your anonymity, and may even work a bit of your story into her show. Thanks!